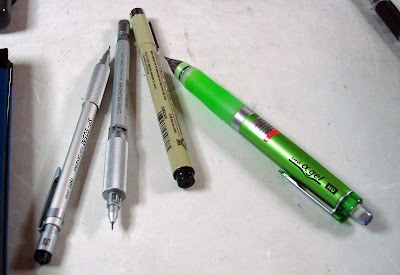 One of my favorite online retailers is jetpens.com - they carry a lot of art/illustration oriented drawing supplies, including the pencils shown below that I use a lot. I just received the green gel mechanical pencil, with its very squishy and comfortable grip. The other two pencils on the right I just bought for their sheer gadgeto-fetishistic design quality. The larger one is actually weighted a little funny for drawing (at least for me, but then again I'm kind of a princess), but the smaller one on the far left is pretty comfy.